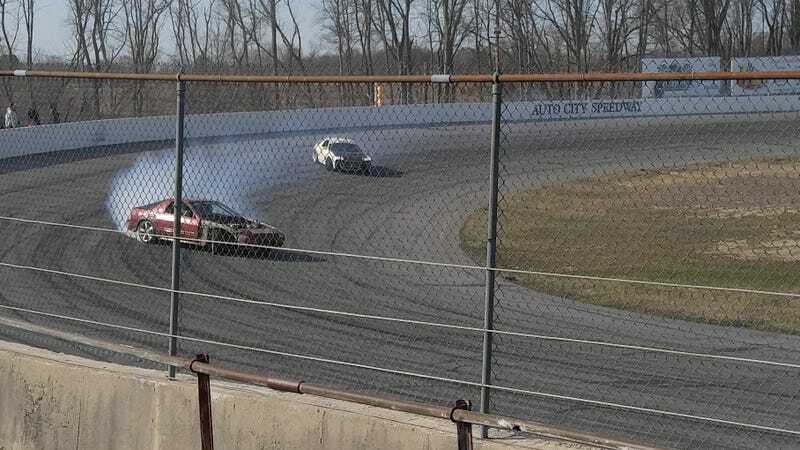 Saturday, my brother and I took a break from the Saab for a few hours to go watch some drifting at the season opener for Mi Drift, held at Auto City Speedway in Clio. We showed up a little late, and left before it got dark, but the show ran from noon to midnight. There was a decent variety there, including FCs, MX-5s, 240SXs, 350Zs, SN95s and a couple of Foxes, BMWs, FR-Ss, and more. Mostly solo runs, but there was some tandem drifting going on too. There are some really great shots out there, including angles you can’t get from the stands. I saw a couple of quadcopters in the air, and there was also a Volvo wagon with a camera rig on the hood to capture some close-up footage. The Mustangs looked particularly tail-happy on the track. One kissed the wall and bounced back with little more than bumper scratches (and maybe some broken fasteners. Another smacked the barrier and sprung a radiator leak, retiring for the day. In the paddock, there was a Fox with a blown head gasket on its turbo carb’d 302, and the team was working to replace it in time to get another run or two out of the car before the day was over. When we checked on them again before leaving, they were torquing the head down and would soon have the car back out there. As you’d expect, some drivers were better than others, but everyone was having a blast getting sideways. There were more than a few spinouts, as drivers explored the limits of their cars and strove to expand their own skill limits. Just as we were about to leave, we spotted this FR-S being towed from the track back to the lot. Pictured: probably not a member of the Fujiwara family. The license plate read “TAKUMI” though. I wish we could have stayed longer, but we really needed to get back to wrenching on the Saab.